Published Feb 10, 2015 by Pearson IT Certification. Part of the LiveLessons series. 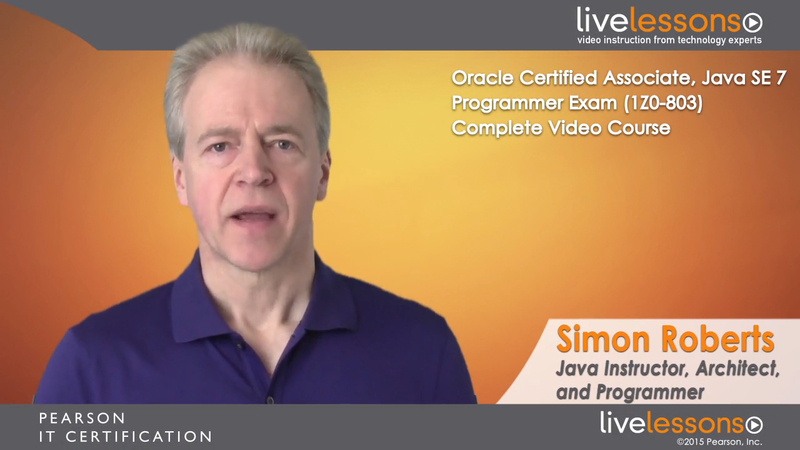 Oracle Certified Associate, Java SE 7 Programmer Exam Complete Video Course is a comprehensive training course designed to help you master the Java Certified Associate exam. The course brings the Java Certified Associate exam topics to life through the use of real-world live instruction, demonstrations, and animations, so these foundational Java programming topics are easy and fun to learn. Simon Roberts—a leading Java instructor, trainer, book author and video trainer, and creator of the original Sun Certified Programmer, Developer, and Architect certifications for Sun Microsystems—will walk you through each topic covered in the exam, so you have a full understanding of the material. He begins with an introduction to the Oracle Certification program and also discusses preparation and test-taking strategies, so you can begin your training confidently. Simon then dives into the exam topics, covering all objectives in the Associate exam using a variety of video presentation styles, including live whiteboarding, code demonstrations, and dynamic KeyNote presentations. The primary audience includes candidates for the Oracle Certified Java SE 7 Associate Exam; however, anyone interested in building a basic competence in the Java programming language will benefit from using this course. The audience should have a basic knowledge of Java or another object-oriented programming language in the syntactic traditions of C/C++. For example, a candidate with a good knowledge of C# should be able to benefit from this material, even if one does not have prior experience in Java. Lesson 1 Why would i take the oracle certified associate java programmer exam?